Im tall and I have big feet, size 15, normal width. I have a Morton's neuroma on my foot - thank you TOSRV ride. These shoes fit and do not die, not ever. Last pair lasted 14 years 20 k miles, you count the revolutions that adds up to. I don't know of any shoe this size at this quality point. Thanks Sidi. Who wouldnt want SIDI shoes? A shoemaker once laughed at my feet, said they werent within his abilities to fit. But the SIDIs fit. A four because I havent ridden in them yet. But my feet know. Also, clearly high quality. Expensive for me, but glad I got them. 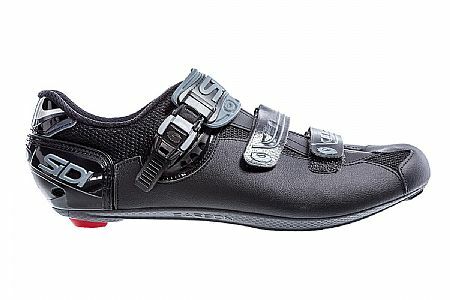 I had heard Sidis run narrow, and for years I bought other (some more expensive) shoes because the LBS in my area did not carry these so I could not try them on. Finally I got tired of the other shoes falling apart, or hurting, or making my feet numb or hot, so I decided to try these based on the recommendations from my fellow cyclists. Because of the perceived narrowness, I bought men's shoes. But they are not narrow. They are great shoes and feel wonderful, with nice details such as easy tightening and loosening without unclipping. They have a nice stiff sole and the toe box is roomy. The heel is actually a tiny bit loose - I probably could have bought women's. And as a bonus, they are in colors to match my Bike ). fits well & is comfortable. Looks great with the color combs I selected. Good quality in stitching and material. I doubt that I could find a more comfortable, long-lasting road shoe than my Sidis. I have found that wearing Sidi shoes is like a long happy marriage and I am not interested in another affair with my feet. These shoes get better with each generation. The Genius 5 Millennium 4 is simply outstanding. I am sure this pair will last me a long, long time as my past shoes did. Hate to give up my ancient Sidis...they've been such a loyal partner. Sidi is simply the best cycling shoe. I own four pairs of Sidi cycling shoes. I still have the first pair I bought probably over 15 years ago & they still work. The fit is the best, very comfortable. Italian design and workmanship is the best.